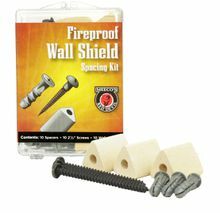 Keep walls safe from hot, wood or coal stoves, with this Wall Spacing Kit. These pre-drilled ceramic spacers create an insulated air space between heat shields and walls. Walls insulated by this air space are protected from nearby hot stoves. Used to safely reduce minimum wall and ceiling clearances between the heat shield and the wood stove. Recommended for mounting all types of stoveboards. This kit includes 10x 1" ceramic spacers, 10x 2-1/2 " black oxide screws, 10x wall anchors (will need 1/4" hole drilled), and mounting instructions. Provides 1" of air wash space to protect walls from damage.